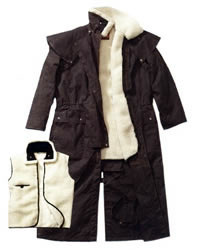 The world famous authentic Australian Outback Drover Coat was originally built for outback stockmen over 100 years ago. Built to protect, whatever the weather. Large stand-up collar and neck tab, generous cut for layering, extra long length and leg straps. The removable cape helps you keeep dry. Deep fantail gusset, horse and rider screenprint lining and adjustable shockcord waist. Add the optional wool liner to keep you seriously warm.